Creating new and original recipes can present some problems. Messy, disgusting, throw it in the garbage can problems. I think that’s one of the reasons that I haven’t been baking much the last year or so. Since I can’t use dairy, I tend to have a lot more failures than successes. 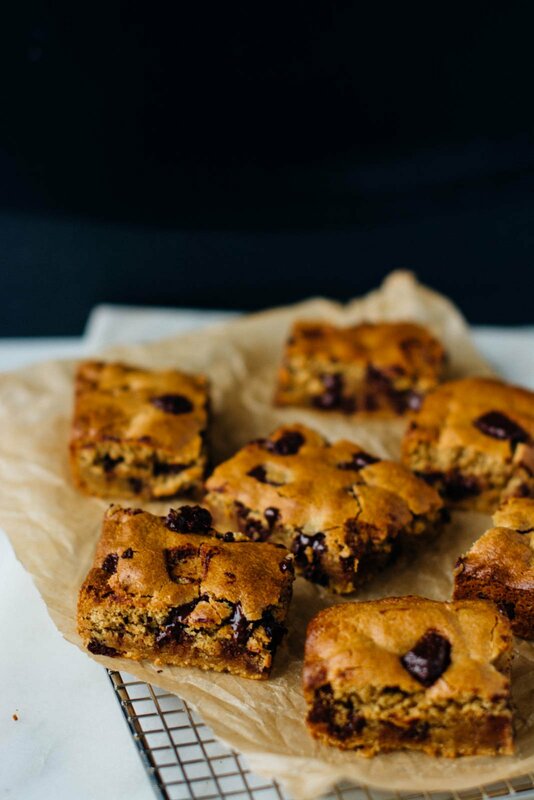 Like with these chocolate chip cashew butter blondies. I’ve made four versions this week. The first ones tasted ok, but you couldn’t even attempt to eat them without a huge glass of milk. The second time I made them I tried to make them vegan and used Aquafaba but they tasted like sand and were gritty, really unpleasant. I added eggs the third time and was super happy with the result. My son ate the entire batch in one evening and the fourth time I baked them was just to make a few tweaks and to guarantee consistent results. I think I’ve also gained a few pounds this week sampling all the different versions, oh the sacrifices I make for my art. I want to spend more time this Fall and Winter baking at home. I am obsessed with the Great British Bake Off, and every time I see these home cooks whip up puff pastry or make filo pastry from scratch, I feel inadequate. I enjoy baking but the precision required has always caused me to shy away from the process. 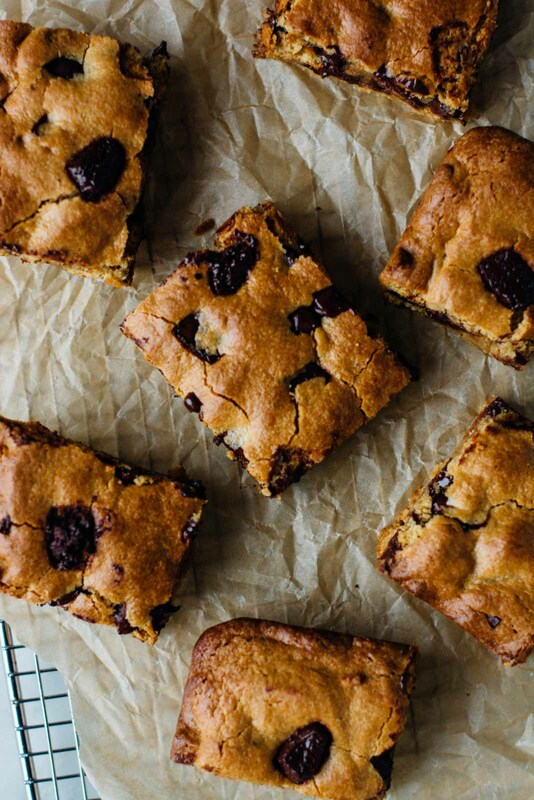 Since discovering my son’s dairy allergy, it’s also that much more daunting to attempt a dairy-free version of all our favorite baked treats. 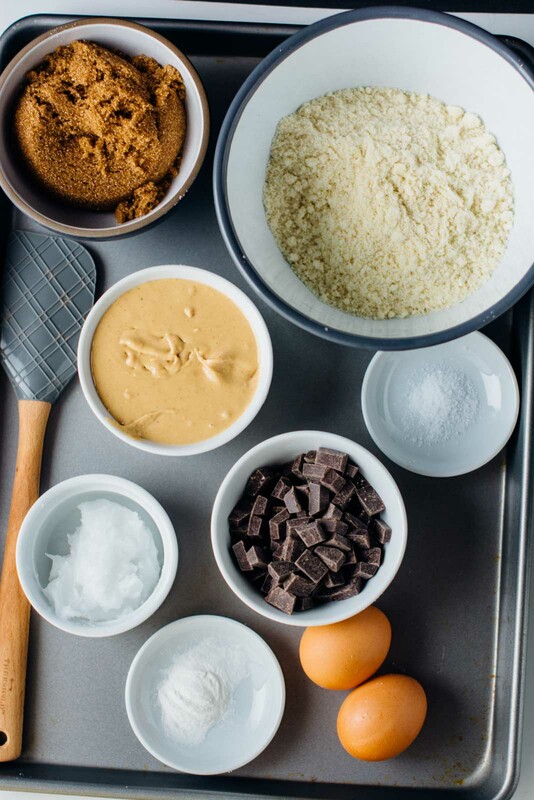 I am more of an intuitive cook where I stray far away from a written recipe and create something new, but that mentality can be dangerous when applied to baking. 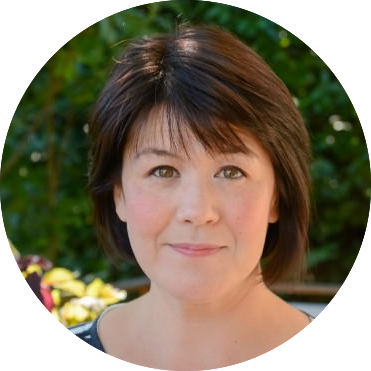 There is a science to baking, measuring and ratios are vital, and that is not something that comes easily to me. But first, I need to get an oven. Yes, that’s right, you heard me, I have been without an oven since last Thanksgiving. I have a cooktop but no way to roast, or bake except for a cheap toaster oven that is sitting on my counter. The first few months I tried to repair my existing oven, but that turned out to be futile, and then I couldn’t make up my mind about what I wanted in a new oven and then time just got away from me. A year later, here I sit, without a way to cook a tray of muffins or a layer cake. It hasn’t been all bad; I’ve baked bread, made breakfast bars, and roasted vegetables, and the toaster oven doesn’t heat up the kitchen, but I can’t multi-task, so everything has to be cooked in stages. 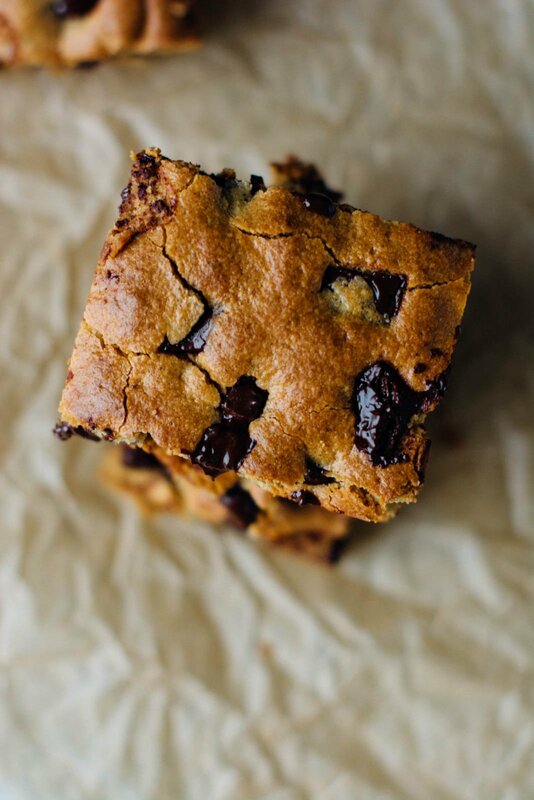 These chocolate chip cashew butter blondies are ideal for my toaster. Baked in an 8×8 tin, they are quick and easy to put together. 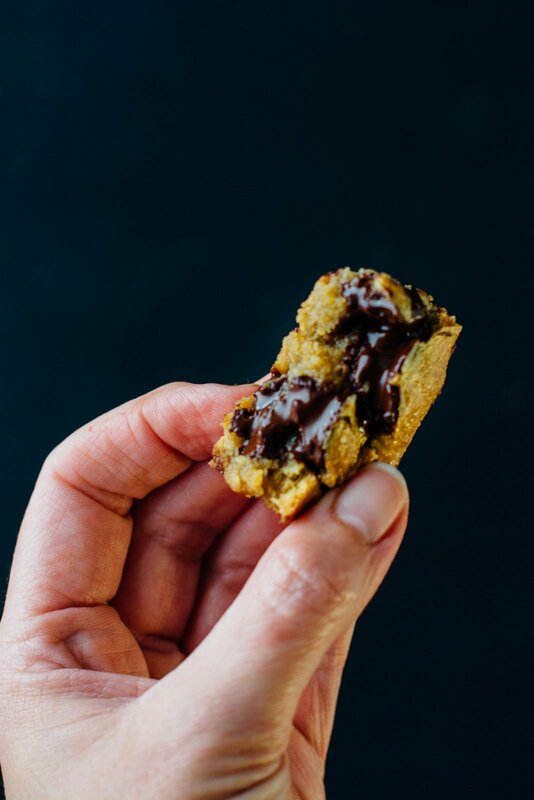 These treats are dairy-free, gluten-free and paleo so they are a perfect addition to all those potlucks coming up during the holiday season. 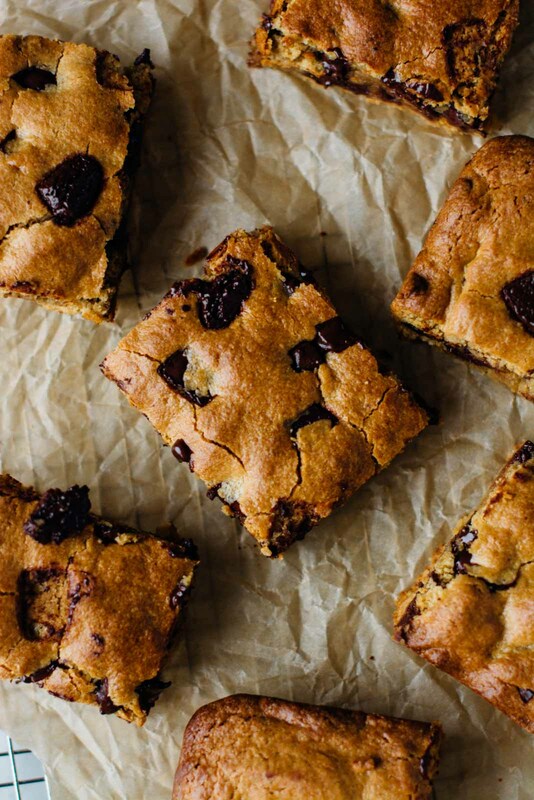 My son can’t tolerate any dairy at all but he does fine with eggs, and they give these blondies a much better rise and texture. 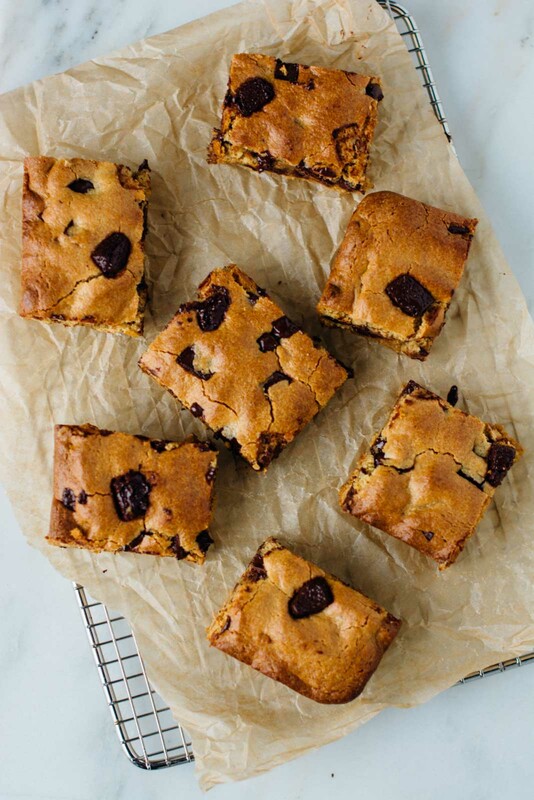 These gluten-free, dairy-free and paleo chocolate chip cashew butter blondies are easy and quick to put together! 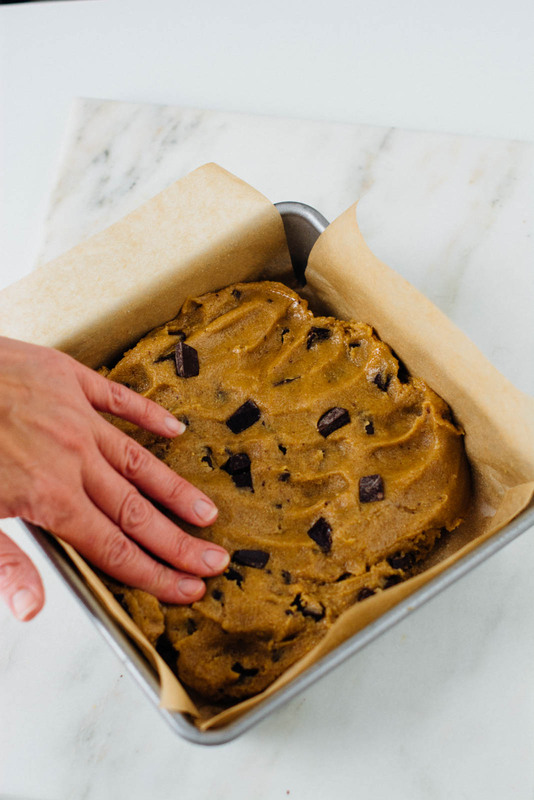 Pre-heat the oven to 350 degrees and line an 8x8 baking pan with parchment paper. In the bowl of a stand mixer combine the coconut oil, cashew butter and brown sugar and mix on medium speed until well combined. Add the eggs one at a time, mixing in between additions until light and fluffy. Add the vanilla extract and blend for a few seconds to incorporate. If your almond flour isn't very fine you can pop it into a high-speed blender and process for 30 seconds but make sure not to blend it too long, you don't want to end up with almond butter. In a medium bowl combine the almond flour, baking powder, and kosher salt and stir well to combine. Add the flour mixture to the mixer and blend on low just to mix everything together. Add the chocolate chips and stir to combine. The mixture will be fairly stiff, it should be like chocolate chip cookie dough. Spoon the dough into the prepared pan, level and smooth the top. Bake for 30 to 35 minutes until golden brown and a toothpick inserted into the center comes out mostly clean. Let cook completely before slicing into 12 pieces.